Bend is in a historical migratory corridor where there is a critical need for crossings over Highway 97 to provide passage between summer and winter ranges and to reduce thousands of costly wildlife-vehicle collisions every year. Connecting animals to their seasonal ranges is critical for their survival. Spend the evening learning about barrier-free movement and find ways you can help through a selection of short films from around the west on migration of large game species like deer and pronghorn antelope. 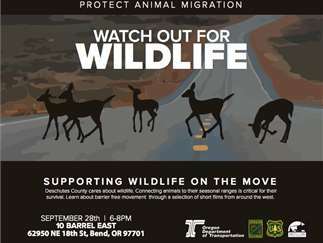 This event is presented by PROTECT ANIMAL MIGRATION (PAM) in collaboration with the Oregon Department of Transportation (ODOT), Oregon Department of Fish and Wildlife (ODFW), the US Forest Service (USFS), the Oregon Wildlife Foundation (OWF) and the Oregon Hunters Association (OHA). Biologists from ODOT and ODFW will be on hand for Q&A discussions during the festival.